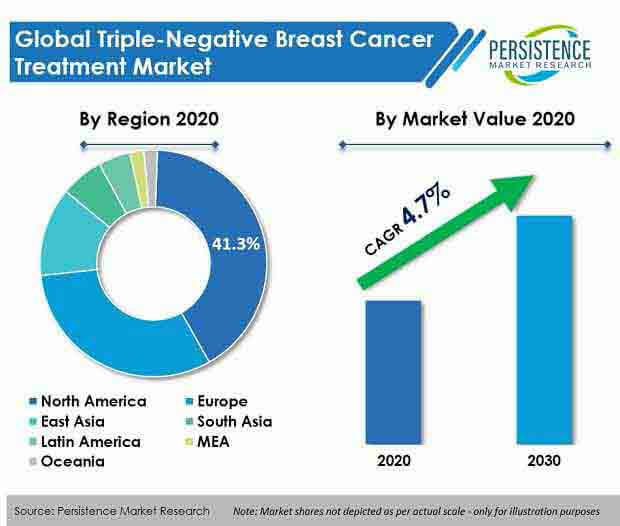 Triple Negative Breast Cancer Treatment Market : Segmented Based on Drug Type – doxorubicin, cyclophosphamide, paclitaxel, docetaxel, carboplatin/cisplatin and others; Based on distribution channel - hospital pharmacies, specialty cancer clinics. Triple-negative breast cancer is a type of cancer that does not have receptors for the hormones oestrogen and progesterone or the protein HER2. Triple-negative breast cancer is a rare type of cancer. About 10–20% of breast cancers are found to be triple negative. Triple-negative breast cancer does not responds to hormonal therapy or therapies that target HER2 receptors such as Herceptin (trastuzumab). The treatment combines surgery, radiotherapy and chemotherapy. Triple-negative breast cancer is more likely to spread beyond the breast and has chances of reoccurrence after 3 years. New chemotherapy drugs and combination drugs are under development for the treatment of triple-negative breast cancer. The global triple-negative breast cancer treatment market is projected to grow at a CAGR of 4.7% throughout the forecast period (2018–2026). The global burden of breast cancer is increasing owing to growing aging population along with the changing life style and excessive consumption of tobacco and alcohol, which is consequently expected to drive the growth of the market for triple-negative breast cancer treatment over the forecast period. The robust pipeline of drugs in clinical development to treat breast cancers is also expected to drive the growth of the triple-negative breast cancer treatment market over the forecast period. Collaborations among the key players in the research and development of new and innovative drug and therapies is also expected to drive the growth of the triple-negative breast cancer treatment market over the forecast period. North America, followed by Europe, is expected to be the leading regional market for triple-negative breast cancer treatment, owing to growing prevalence of triple-negative breast cancer and increasing number of clinical trial for combination therapies. Growing awareness regarding the treatment of triple-negative breast cancer in underdeveloped countries such as Africa is expected to drive the growth of the market for triple-negative breast cancer treatment over the forecast period. Asia-Pacific triple-negative breast cancer treatment market is projected to have continuous growth over the forecast period due to increasing prevalence of breast cancer and improving treatment rate for cancer. Improving treatment-seeking rate in middle- and low-income economies and access to safe and effective treatment and timely and accurate diagnosis of cancer is further expected to drive the growth of the triple-negative breast cancer market. Growing emphasis on the research and development of drugs and therapies for rare disease creates a huge opportunity for the market of triple-negative breast cancer treatment. Growing number of clinical trials for the combination therapies along with the collaboration among the major players is the key trend in the triple-negative breast cancer treatment market, which is projected to spur the growth of the triple-negative breast cancer treatment market over the forecast period. The global triple-negative breast cancer treatment market is segmented into five key regions, namely North America, Latin America, Europe, Asia Pacific, and the Middle East & Africa. In terms of value, North America is expected to be the leading regional market for triple-negative breast cancer treatment and is expected to have significant growth during the forecast period. The Asia Pacific excluding China triple-negative breast cancer treatment market is projected exhibit significant growth over the forecast period due to increasing prevalence of triple-negative breast cancer and rising diagnosis and treatment rate in the region, particularly in China and India. Examples of some of the key players operating in the global triple-negative breast cancer treatment market are AstraZeneca PLC, Pfizer, Inc. , F. Hoffman - La Roche Ltd. , Bristol-Myers Squibb Company, Novartis AG, Mylan N.V. , Eli Lilly and Company, Celgene Corporation, Sanofi S.A., and Johnson & Johnson Services, Inc., among others.